On the 12th May 2018, my grandmother passed away just a month shy of her 91st birthday. Time has sped past so quickly since I’m having trouble keeping up with the days; it’s hard to believe that this time a week ago I was home, helping in what small ways I could with the funeral arrangements and preparing for it. The lovely and loving service was full of references to what made her such a wonderful woman: her resilience, warm hospitality, faith, sense of humour, intelligence, amazing cooking (you haven’t eaten unless you’ve tried one of her famous caramel or passionfruit tarts) and so much more. I’ve spoken of Nan (what I always call her) only in brief on the blog before – the last time was probably when she suffered her first stroke four years ago. In truth, I wasn’t sure if I wanted to talk about this news here and now. I asked myself whether it would it be better to let the shock and sadness settle first? That is if I talked about it at all. 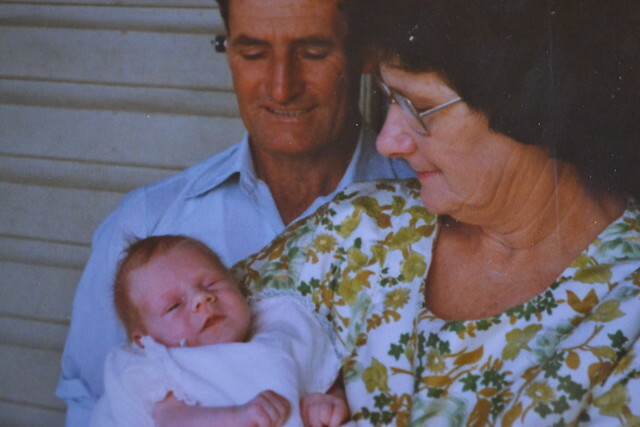 Nan holding me as a baby with pop looking on. But then I thought that saying nothing would be wrong. That I would allow myself this opportunity to honour her life with this humble tribute. That I wanted to share one small story before I sign off. I’ve written about my experience with Vanishing Twin Syndrome before in my piece in The Sound of Silence, when I discovered at nine weeks into my second pregnancy that I had been pregnant with twins but one had died at some point in the eighth week. I visited home just after receiving that news, still reeling from the shock and trying to process the accompanying feelings: sadness at the loss, relief that one foetus had survived and worry about its prospects too. One morning my nan came to visit and for some reason we ended up alone in my parent’s sitting room. We sat together on the long lounge. She knew the news and could tell what I was feeling; she took my hand and we sat there quietly. No words were necessary. She waited until I was ready to talk. After a while I was, and then we did. I was always so thankful for that perfect gesture of compassion. The above photo was taken on our first visit back to my grandparent’s farm after my father passed away in 2009. As an NSW-expat for almost twenty years now, I can say there is nothing like returning to the sunshine of a northern NSW winter, which is when that was taken. And now I’ve just returned from similar weather to cold, gloomy Victorian skies I hold memories like that, and being surrounded by loved ones at an event as sombre as a funeral, very close.